The Grain Store can sleep 6 comfortably and has 2 double bedrooms plus a twin bedroom and 2 bathrooms. 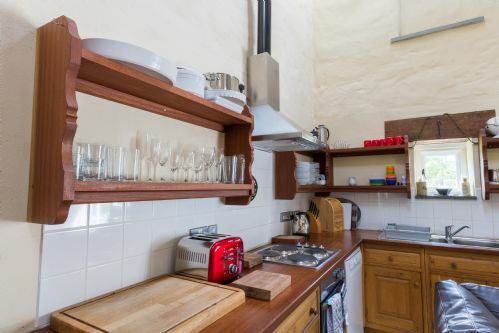 There is a double height open plan kitchen/dining/living area with a log burner. The upstairs bedroom can take a cot or an extra single camp bed. 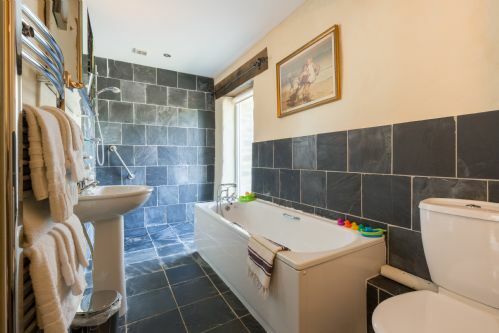 The cleanliness of the cottage was to a good standard particularly in the bathrooms. The fluffy bathroom towels were to a luxury standard and there was plenty of them. The bathroom toiletries were a nice touch too. The open storage in the kitchen area did mean that everything we used we had to clean first due to dust and cobwebs. Unfortunately, some of the baking trays still contained grease on them which meant we had to give them a good scrub and also we couldn’t get the toaster to work which we think is broken. That said the kitchen was very well equipped with plenty of crockery. The living room furniture was very worn. The ripped sofa could do with replacing as could some of the dining room chairs. The duvets, pillows and bedding were clean and comfortable. The one area that wasn’t actually very nice was when we opened the velux window on the landing ( which had not been opened for a while ). We had a complete invasion of flies which wasn’t pleasant at all. We are aware that this comes with the territory of living in the country but the volume of flies was unbearable. My husband went out to get fly spray which then had the added disadvantage of dead flies dropping on us throughout the day and evening ( even landing whilst we were preparing food ). We do feel that this does require attention – we are not sure if there is something decomposing around the roof /window area. We had no contact from the owner / representative at all during our stay or even when we departed. So I assume they were very hands off which was fine for us. I guess if we needed anything we had to call the number in the book. 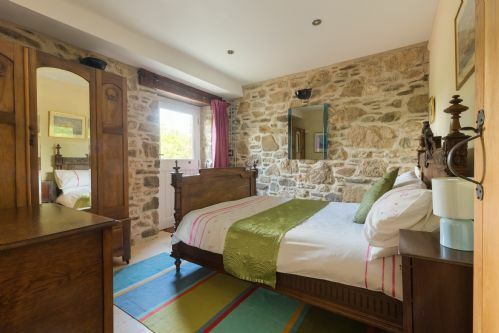 The layout of the accommodation worked well for us as we were two families holidaying together so it was easy sharing the two cottages and for this reason we would recommend this property to others looking for the same. An absolutely lovely cottage situated less than 10 minutes drive from the Newgale Beach. It is situated in a quiet area. I took my two children and they loved the cottage and play area outside. There is also a fire place and facilities to barbeque. The Grain Store has a lot of character with the choice of deco. There is also wifi which was of good connection. Local supermarket is within 20 minutes drive. Karen was very approachable and quick to respond to our queries. I would definitely stay here again in the future. We were warmly welcomed by our guests and found a "like home" atmosphere in this comfortable and well equipped location. 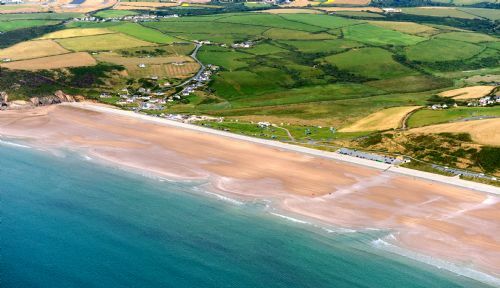 We highly recommend this place for families seeking to discover the beauties of Pembrokeshire. Excellent stay. Great hosts, amazing setting and fantastic accommodation. We would recommend this to anyone who wants a relaxing break. An excellent week's stay for the whole family. We booked the Grain Store together with the Cart House for a family celebration. The Barns were all we had hoped for. The conversions have been very well done with clever engineering to make the Barns very Green. The Grain Store is notable for the wide range of old artefacts adorning the walls. The location, rural but near enough to beaches and towns, is ideal. Karen and Jeff, the owners, are very friendly and efficient but not intrusive in any way. We all enjoyed our stay. A beautifully clean and well appointed barn set in stunning countryside. A beautifully clean and well appointed barn set in stunning countryside. I loved the eclectic mix of antique and contemporary furniture. 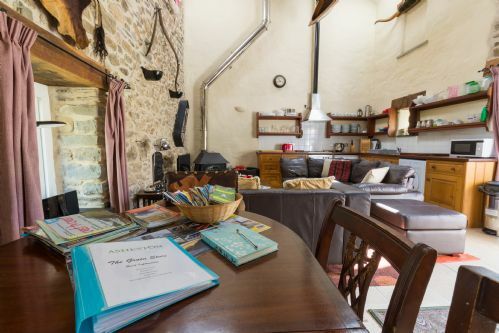 The barn was really warm and cosy and the owners had equipped it with everything one needs to enjoy their holiday. The kitchen was home from home - lots of equipment and gadgets. The linen and towels lovely and crisp and white, together with really nice toiletries/bath products. The owners Karen and Jeff were great hosts and attentive to any requests. Asherton House Eco Barns are perfect for all ages and family groups - excellent location, only 15 mins. from nearest beach. Thank you - we would love to come back! We spent two weeks at The Grain Store and enjoyed our time there. The tranquil location was just what we were after. Our kids (7 and 4) loved the play area and there was plenty of space to kick a ball, fly a kite and run around. There's also plenty to do in the area. The owners were welcoming and helpful. We had a problem with the washing machine and they came and sorted it out the next day. The negatives were that the mattress on the upstairs bed was past its comfortable life and needs to be replaced. Also, a lot of the kitchen crockery, glasses, utensils etc needed washing before we could use them because they and the shelves they were on were dusty and / or greasy. There's also a big American style fridge-freezer that's quite old consequently noisy when it's running. We had to go during school holidays so it didn't feel like particularly great value. We'd recommend this as a place to stay but during the cheaper times of the year. 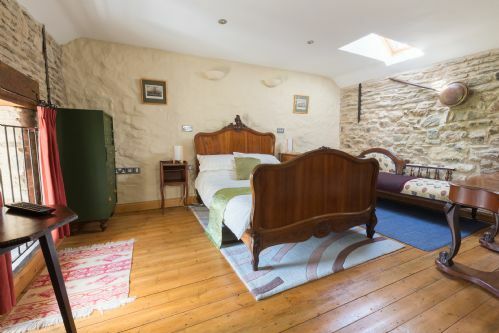 A lovely and relaxing place to stay,in a location that makes the whole of Pembrokeshire easily accessable.The Grain store was in very good condition, and the grounds were kept very clean and tidy. The owners were very helpful and approachable. This barn was absolutely gorgeous, clean and comfortable. Set in a beautiful part of the Welsh countryside we couldn't of asked for anything more. A perfect addition is that this barn was completely eco-friendly, simply amazing. 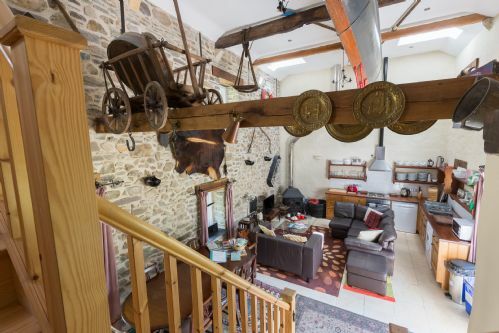 The barn is beautifully converted and looks great from the inside and outside. It contains everything you need for a comfy holiday. Garden and playground outside is great as are the views. We recently stayed at The Grain Store with friends. It was comfortable and well appointed and we all enjoyed it very much. The hosts were very kind and nothing was too much trouble. I would recommend this accomodation. We had a lovely week staying at The Grain Barn. Despite having 4 other barns within close proximity, it felt very peaceful. The grounds were great with fields surrounding a very large garden with excellent childrens playground. The playground had toys for toddlers and a fort and zip liner for older children. Jeff and Karen are on site for adice if needed. It is an easy drive to the charming village of Solva, Newgale beach and St Davids, plus easy access to the numerous Pembrokeshire coastal walks. Highly recommended. An excellent holiday cottage for all ages!! We spent a week in the cottage with three generations of our family from 81 to 9 from the very active to limited mobility, the Eco Barns has something for everyone. 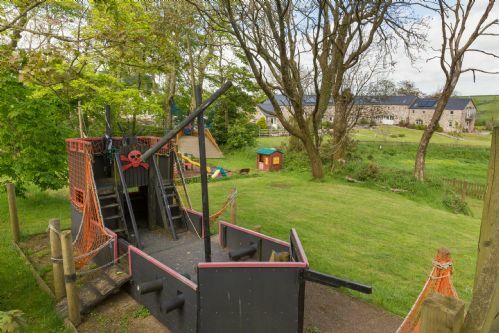 Everything was as portrayed on the Internet plus the kitchen was well-equipped for cooking, the adventure playground was a hit with the kids and the location wonderful. I concentrated so much to ensure that the cottage was good for my mother after her hip operation - I missed that the beds had foot-boards - not so good for my husband who is 6ft 5 - but Karen and Jeff immediately sorted a bed out for him!! I have visited three times now and I absolutely love the barns. Karen and co are fantastic hosts and I always have a relaxing time away from the stresses of my everyday life. Thank you for a lovely stay as usual! Excellent standard of accommodation. Highly Recommended. Thoroughly enjoyed the stay. We were a group of 7 families accommodated in 4 of the cottages. Great. Nice view and arrangements. Kids enjoyed in the play area. Highly recommended. We had a wonderful time at the Eco barns and the first impressions were Wow and the lasting impressions are wow! Great place to stay and easy access! This is a great place for a family holiday, although you'll definitely need your own transport as it's off the main roads, but that makes it peaceful and gives a real feeling of getting away from it al in a lovely rural setting. It's not far from fantastic beaches, walks, boat trips and the lovely little city of St. David's. 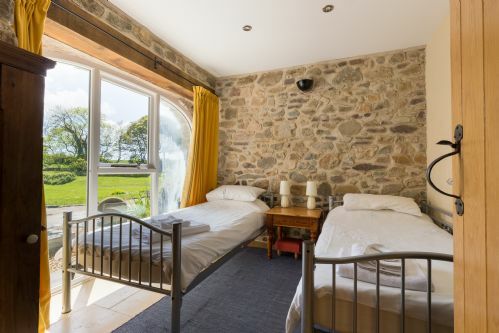 The Grain Store was fine for 5 adults if one doesn't mind sleeping in what would sometimes be a children's room. It's very well equipped and comfortable. We had our own barbeque, and there were playthings for children. Our hosts were helpful and welcoming and there when we needed them. We'd go there again.